En 1979 sucedieron muchas cosas con consecuencias duraderas. Dos de ellas fueron la invasión soviética a Afganistán y la Revolución Islámica en Irán, que llevó al poder a un régimen decidido a recrear no sólo la sociedad iraní sino también gran parte de Medio Oriente. La contienda geopolítica que se despliega entre China y Estados Unidos ha sido descrita por muchos como una nueva guerra fría. Si alguna vez se convierte en una caliente, el punto de ignición bien podría ser Taiwán, en gran parte debido a la política chica con respecto a la isla. Taiwan’s midterm elections got a surprising amount of international coverage this November. President Tsai Ing-wen’s Democratic Progressive Party (DPP) suffered heavy losses against the opposition Kuomintang Party (KMT), winning only six of 22 districts — and losing nine districts it previously held. Tsai resigned as DPP chairperson and announced a “major reshuffle” for the party. Democratic countries that worry about the Chinese government’s attempts to influence their politics should study its success in this weekend’s elections in Taiwan. The many races — for some 11,000 positions in villages, towns and counties across the island — were something like midterms and widely seen as a prelude to the next presidential election, scheduled for early 2020. By my count, candidates friendly to Beijing will now occupy 16 of the 24 top posts that were contested, up from the current six. The people of Taiwan have been taking part Saturday in local elections — an event that people across the Taiwan Strait in the People’s Republic of China (PRC) can only dream of. The vote is taking place amid widespread worries about interference from Beijing, which appears to have organized a full-scale disinformation campaign to undermine the current government of President Tsai Ing-wen and support political forces who favor closer ties with the mainland. 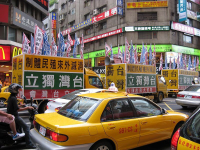 Taiwanese voters will determine the outcome of 10 referendums Nov. 24 as well as local elections. This will not be the first time this autonomous island has held referendums, although none succeeded in the past. Compared to the established democracies of the West, Taiwan’s is still in its infancy. It did not become a full democracy until 1992, and it only held its first direct presidential election in 1996. And yet, Taiwan’s young democracy has made rapid progress, through social movements, representative politics, the judicial process and now, through direct democracy. In the beginning of this year, it rolled out one of the most citizen-friendly systems for ballot initiatives and referendums, giving its citizens more say than ever in the country’s future. Taïwan, «la baie en terrasses», modelé par des hommes venus de Chine continentale; Formose, «la luxuriante», comme l’appelèrent les marins portugais au XVIe siècle; «notre terre» où vécurent des peuplades autochtones qui ont repoussé tout envahisseur durant des milliers d’années; Taïwan, «République nationale de Chine» qui ne demande aujourd’hui qu’à prolonger son expérience de démocratie libre et prospère; Taïwan, en quarante ans j’ai appris à connaître, à aimer et à respecter ce pays merveilleux. Pourquoi l’ONU exclut-elle 23 millions de Taïwanais? L’ONU a été créée pour les êtres humains, mais l’universalité des droits de l’homme proclamée par les Nations unies ne s’applique pas à Taïwan et à ses 23 millions d’habitants. Ce mauvais traitement date de 1971, date à laquelle notre gouvernement a perdu sa représentation dans cette organisation internationale. Et au cours des décennies qui ont suivi, Taïwan a dû faire face à l’isolement et à un certain nombre de défis à cause de sa situation internationale. Pourtant, cette adversité nous a stimulés, et nous n’avons jamais abandonné. Alors qu’elle participe depuis 2009 à l’Assemblée mondiale de la santé (AMS) en tant qu’observateur, cette année, Taïwan sera exclue de cet organe décisionnel de l’Organisation Mondiale de la Santé (OMS) qui se tiendra à Genève du 22 au 31 mai, pour la simple raison que l’OMS ne lui a pas envoyé d’invitation. Mais est-ce bien raisonnable? C’est effectivement la question qu’on peut se poser lorsqu’on examine ce que Taïwan est à même d’apporter à la communauté internationale dans le domaine de la santé publique. A year has passed since the election of the Democratic Progressive Party (DPP), an independence leaning party in Taiwan. At the time, these results were met with strong objections from the Chinese government because of the possible impact on the sovereignty of the island state. In Western media, coverage of the election strongly emphasised the importance of this issue in the decision to elect the DPP. Despite all of this, a year has gone by without any concrete movement towards independence. Yes, Taiwan wants ‘One China.’ But which China does it want? For far too long, the United States has stood idly by and allowed the People’s Republic of China to conduct what is charitably described as a massive power grab throughout the Asia-Pacific region. Taiwan Feels Forgotten. But Not by Trump. The atmosphere here is almost jubilant. The phone call last weekend from President Tsai Ing-wen of Taiwan to President-elect Donald J. Trump — the first contact between a Taiwanese president and an American president or president-elect since at least 1979 — has received rare bipartisan support here on this self-governing island off southern China. It was, many agree, a great thing for the country. Donald Trump’s phone call with Taiwan’s President Tsai Ing-wen has elicited a predictable response from the commentariat: shock and dismay because Trump allegedly upset the apple cart of a bipartisan consensus on how to manage China and its claims on the island of Taiwan. Trump has been accused of undoing 40 years of delicate diplomacy and making a dangerously destabilizing move. On Friday, Tsai Ing-wen will be sworn in as president of Taiwan, having won by 25 percentage points over her nearest competitor. In addition to being the first woman to hold the office, Tsai will be the fourth president selected by popular vote. Her inauguration will also mark the third time the presidency has been passed from one party to another. By virtually any reasonable standard, the Republic of China has become a normal democratic country. Yet its relationship with the United States is anything but normal. La nueva presidenta de Taiwán, Tsai Ing-wen, tiene ante sí una agenda repleta de desafíos. Algunos de ellos guardan lógica relación con la marcha de una economía muy dependiente de las exportaciones en un contexto internacional adverso, con las dificultades para sumarse a los procesos de integración económica regional en curso, las exigencias de la justicia social, etcétera, pero el mayor de ellos, sin duda, es la construcción de un nuevo marco de entendimiento a través del Estrecho, con China continental. On a drizzly Tuesday night earlier this month, Chen Li-hung, a celebrity news television host, strode onto a stage in Changhua, in central Taiwan, and launched into a passionate speech, feeding red meat to his Democratic Progressive Party’s assembled faithful.